We promise mom and dad are all right, they just seem a little weird because they're freaking out over the newly announced Poison and Cheap Trick tour set to kick off in late May with Pop Evil also joining in on the fun for about half of the dates... The bands are fired up to make the journey across the U.S. together. Bret Michaels, POISON lead singer and noted philanthropist, says: "The all-original POISON is headlining again this summer. It's going to be a mega concert and party combined. We will be playing all the hits and bringing high-energy rock and roll good times. I promise this will be awesome. My friends CHEAP TRICK and POP EVIL will be joining us as well as some special guests on select dates. Again, I know all the bands with all the hits will be giving 1000%!!! 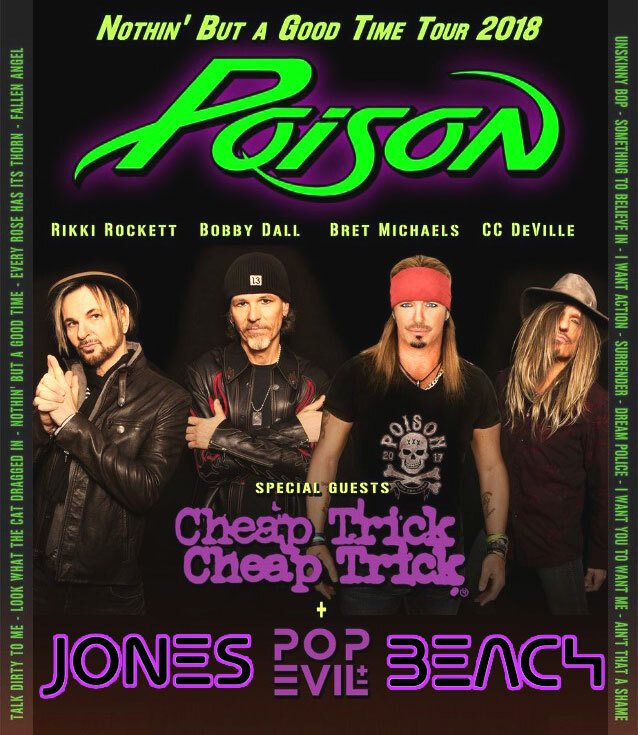 Over the last years, POISON has got to co-headline with some great bands: DEF LEPPARD, MÖTLEY CRÜE, KISS, LYNYRD SKYNYRD, to name a few, but I promise again, C.C., Bobby, Rikki and myself together will bring NOTHING BUT A GOOD TIME!!!" ... "POISON is a just great American rock and roll band," declares Bob Roux, president of U.S. Concerts, Live Nation. "Along with CHEAP TRICK, this show is going to be Nothing But A Good Time - The Full Tilt Party of the Summer. POISON and CHEAP TRICK always deliver the goods." Rick Nielsen, CHEAP TRICK guitarist, proclaims: "Another POISON/CHEAP TRICK tour!!! It's always been FUN with these guys!" .. POP EVIL singer Leigh Kakaty says: "This summer is going to be an exciting one for POP EVIL, that's for sure! What a fantastic opportunity to bring our live show across the country on the big stage with such legends like POISON and CHEAP TRICK."